CGN’s Mobilité passenger ferries provide transportation between Lac Léman towns in France and Switzerland. Ferries go from Lausanne to Evian and Thonon-les-Bains and from Nyon to Yvoire. Passenger ferries operate year round to provide public transportation services between Swiss cities on the northern shores of Lake Geneva and French cities on the southern shores. Ferry boats, currently operating under the name CGN Mobilité, connect Lausanne with Evian (N1) and Thonon-les-Bains (N2) and Nyon with Yvoire (N3). These ferries are an integral part of the Lac Léman public transportation network but are also of use to leisure travelers, especially during the off season when regular CGN Lake Geneva pleasure boats cruise only on weekends. 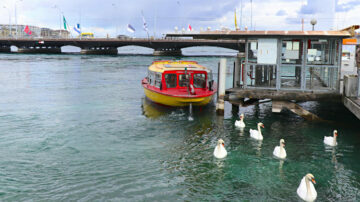 Most ferry boats transport bicycles (not on the Navibus) but no car ferries operate on Lake Geneva. CGN operate three main seasonal timetables for Lake Geneva ferries and cruise boats – winter (mid-October to mid-April), summer (mid-June to mid-September) and shoulder seasons (spring from mid-April to mid-June; autumn from mid-September to mid-October). Always double check the daily CGN schedule – being stuck on the wrong side of Lake Geneva can be very expensive. On national holidays, the Sunday schedule is used, which often means no sailings on some routes and more departures on others. Ferry boat tickets should be bought from ticket windows or vending machines (or online from CGN) before departure. Tickets on pleasure boat cruises (usually all white boats) are also available on the boat itself. Payment is possible in Swiss franc or Euro; most credit cards are accepted. See also Savings Tickets for CGN Boats for special deals that allow for cheaper tickets when cruising on Lake Geneva. CGN and CGN Mobilité boats stop at Lausanne-Ouchy – from here, it is a five-minute metro (M2) ride to Lausanne main train station and city center, or a long, very hilly walk. 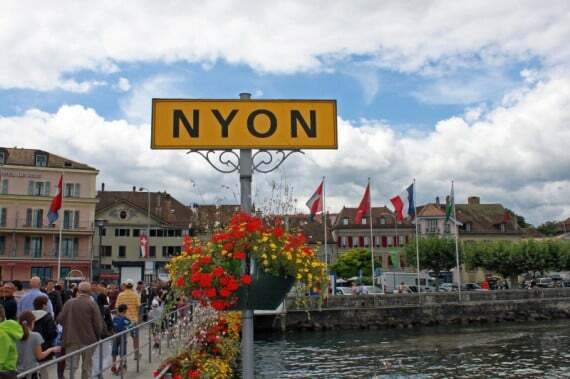 In Nyon, it is a 10-minute uphill walk from the boat landing to the train station. CGN Mobilité (previously Navimobilité) line N1 connects Lausanne-Ouchy in Switzerland with Évian-les-Bains in France in around 35 minutes (20 minutes on the Navibus services). With up to 28 crossings per day, this is is a great option for cruising in winter and the off season when tourist pleasure boats are not sailing on Lake Geneva. Passenger ferries on route N1 operate year round. The earliest departures from Monday to Saturday are just before 5 am from Lausanne and 5:40 am from Evian. The first sailings on Sundays are usually around 9:30 from Lausanne and 10 am from Evian. The last regular boats of the day are usually 8 pm from Lausanne and 8:45 from Evian. On weekdays, Navibus services operate until 10:30 pm from Lausanne and 11 pm from Evian – these late boats are also operational on Saturday and Sunday during high summer. 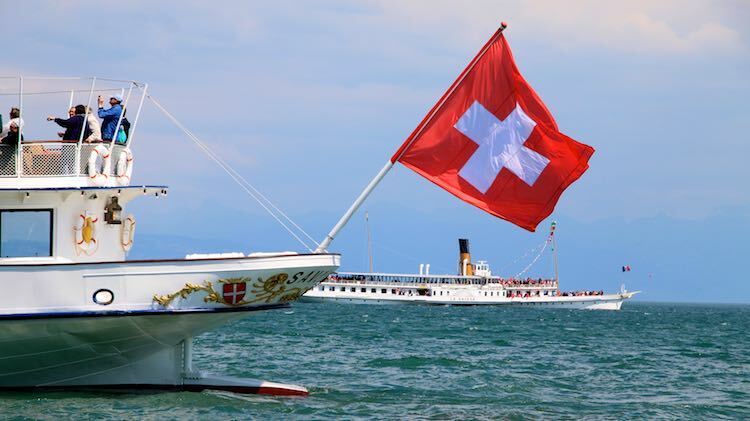 On Sundays, the first boats from Lausanne are at 9 am (7:40 in summer) and at 10 am (8:20 in summer) from Evian. The last boats on Sundays are usually at 6:40 pm from Lausanne and 7:20 pm from Evian. During summer, Navibus services are available also on Sunday. Second class (first class) fares on the Lausanne to Evian ferries are around CHF21 (CHF30) one way and CHF36 (CHF51) return. Buy tickets before boarding. See also: Passenger Ferryboats from Lausanne to Evian and Thonon for more details. CGN Mobilité line N2 connects Lausanne-Ouchy in Switzerland with Thonon-les-Bains in France in around 50 minutes (27 minutes if a Navibus is used – mostly late night). 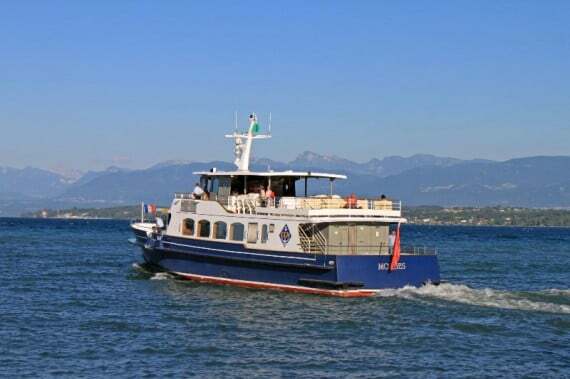 Line N2 generally operates only on weekdays – in summer, a few boats may be available on weekends but often as part of regular CGN Lake Geneva pleasure boat cruises, which will stop en route with significantly longer sailing times. Line N2 operates year round from Monday to Friday. The first (last) boat of the day sails from Lausanne at 4:40 am (10:30 pm) and at 5:40 am (11 pm) from Thonon-les-Bains. Second class (first class) fares on the Lausanne to Thonon ferries are around CHF30 (CHF50) one way and CHF50 (CHF70) return. Buy tickets before boarding. Passenger ferry line N3 is a tourist favorite – it links the lovely Swiss town Nyon with the French medieval town Yvoire, a very popular day-trip destination from Geneva and Lausanne. Crossing Lake Geneva here takes only around 20 minutes. In summer, many boats also call at Nernier, a small French fishing village that is a pleasant stroll from Yvoire. 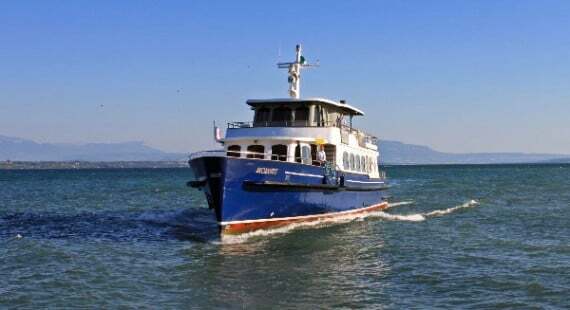 Passenger ferry line N4 connecting Nyon with Chens-sur-Léman in France has been suspended with the upside for visitors a great increase in the number of sailings on the more popular N3 route. The winter schedule on route N3 is limited to weekdays with up to 13 sailing in each direction. During the shoulder season, up to 15 lake crossings are possible on this route on weekdays and around ten on weekend. Note that the last boats on weekends are around 18:00. During summer, up to 23 boats per day are available between Nyon and Yvoire. Last boats in summer are after 22:00. First boats depart around 6 am from Yvoire and 6:30 from Nyon with the last boat 19:50 from Yvoire and 20:15 from Nyon. 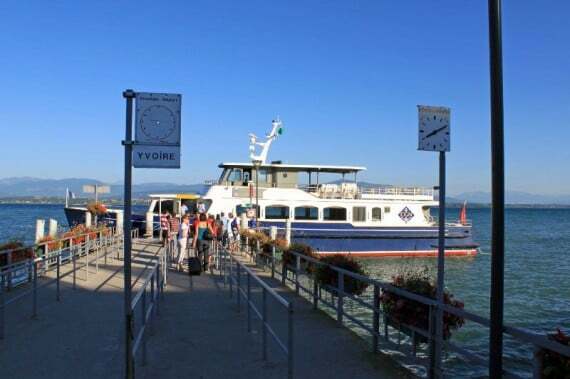 In summer, a few later boats may also be available but double check schedules – other public transportation options from Yvoire are fairly limited and complicated. Second class (first class) fares on the Nyon to Yvoire ferries are around CHF15 (CHF21) one way and CHF26 (CHF36) return. Buy tickets before boarding. See also: Pleasure Boat Excursions to Yvoire on Lake Geneva for more details. Mouettes are small ferry boats used in Geneva city on four routes to cross from the right to left bank of the lake and Rhone River. These yellow Mouettes boats operated by Unireso require a simple “Saute de Puce” (fly’s jump / short ride) CHF2 ticket (or any other public transportation ticket). It is a pleasant way to cross the lake without having to endure long detours when using buses or trams. The Mouettes operate year round. See also Pleasure Boats and Ferries on Lake Geneva for an overview of boating options on Lac Léman.